Global MD for LabStore, Y&R's retail & shopper marketing agency network. Decodes the present, forecasts the future. And loves to shop too. 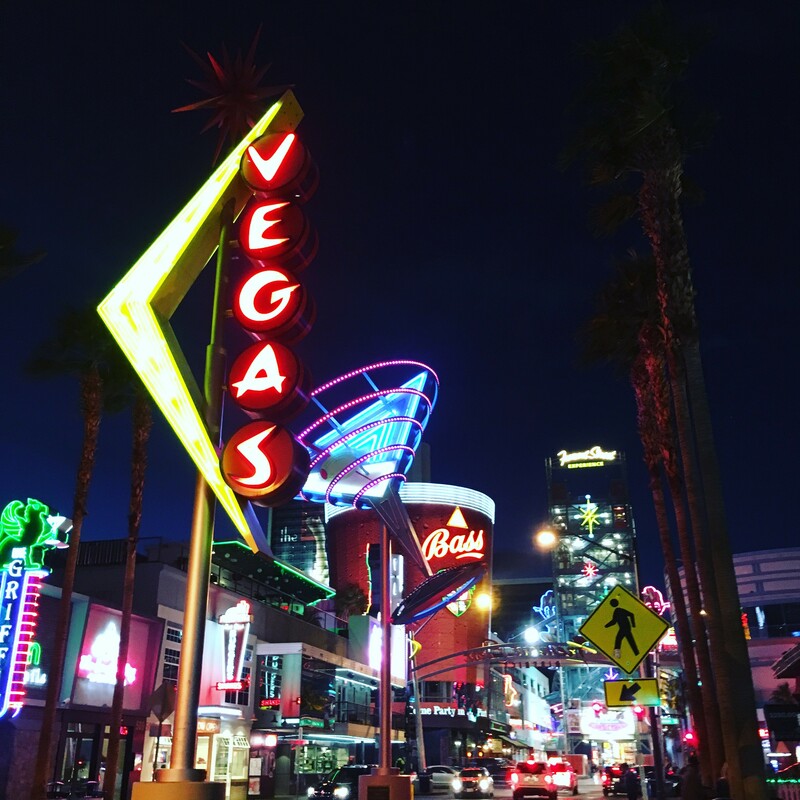 Las Vegas emerges like a shimmering dream right out of the desert. Or perhaps it's more of a nightmare. It all depends upon your perspective and predilections. But no matter your point of view, this is a city that is neon-bright, brash and ballsy. After all, it's Vegas, baby. CES is the International Consumer Electronics Show, a celebration of all things electronic. And it is humongous. This year, 170,000 people attended. To put the number into context, that's about the population of Fort Lauderdale, Fla. - all at one show, in one place, at one time. Those 170,000 people ogled 2.47 million square feet of displays, from 3,800 exhibitors. And that's before you got to the associated conference, which was equally mega. Because of its size, if you're not careful, CES can seem to exist in a constant state of gridlock. Cabs are insanely hard to come by (thank God for Uber, which rolled into town officially 18 days prior to the event). Venues are sprawling (I certainly "got my steps up" just walking through the casinos and expo halls to each event). And you have to like the close proximity of crowds. But for all that, CES was not just an incredible experience, but also an invaluable one. 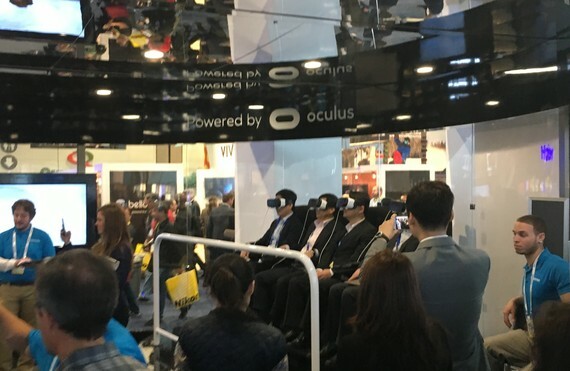 To get an inside look at what's hot and what's to come, I took part in a private tour of the CES show floor hosted by Irwin Gotlieb, the chairman of media powerhouse GroupM*. Reflecting on the tour, and my whole CES visit, I summarized what I saw into three 'I's' - Immersion, Interaction and Innovation. Immersion - besides the ubiquitous IoT (Internet of Things), I think immersion is the key tech trend from the show. Whether it's higher definition screens (forget 4K, here comes 8K and 16K), Virtual Reality or 3D Audio, everything about tech is being designed to be as immersive as possible. Realer than real. In terms of immersive screen quality (and screens are, of course, everywhere at CES), Gotlieb is skeptical about the real reason for screen improvement. "They (the tech companies) need an excuse to put the prices up." No matter - we saw a gorgeous 100-inch set that Gotlieb says will be the norm in three years. In five years, it will be 120-inches. Screen resolution will continue to escalate - the Tokyo Olympics this year will be broadcast in native 8K. Screen technology is also changing. Besides Organic LED, we witnessed Quantum Dot and Backlight Master Drive - all with blacker blacks, brighter colors and imperceptible pixels. 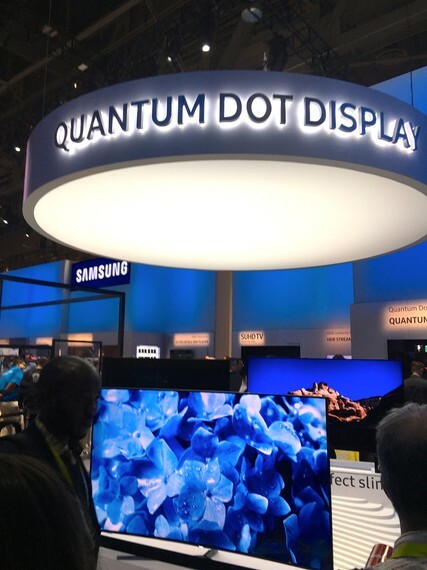 Gotlieb showed us one Quantum Dot screen that he warned us not to look at too long. "You won't be able to go back to your regular TV," he joked. Virtual Reality was also all over the show. This made for some humorous scenes, such as a stadium full of VR participants with headsets on, absorbed in their virtual worlds. VR content is improving dramatically, and it is becoming far more accessible. One smart innovation I noted was the Figment VR mobile phone case, which instantly turns your phone into a VR viewer. Sennheiser* demonstrated 3D audio. This makes stereo sound feel, well, tinny and two-dimensional by comparison. Via an $80,000 black box and strategically placed speakers, you feel like you are in the middle of a concert performance, right there along with the artists on the stage. The sound is rich, expressive and immersive. 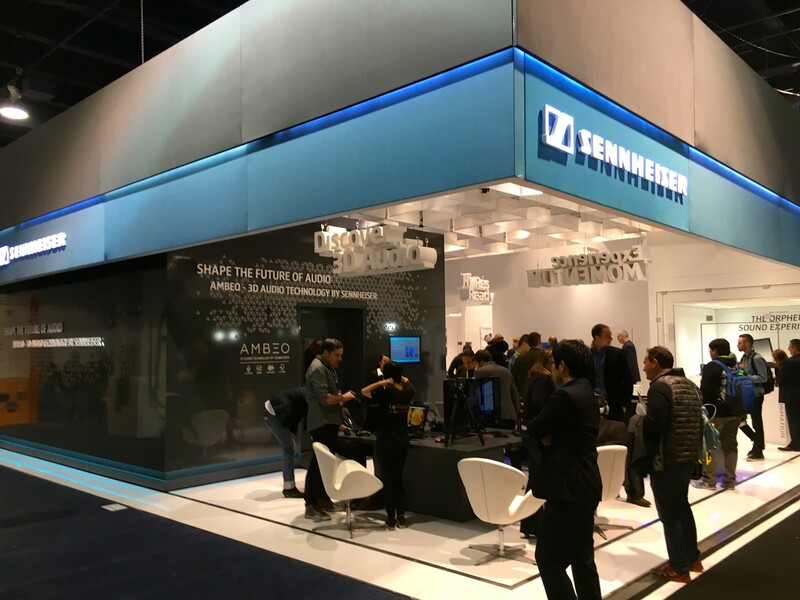 Sennheiser also demonstrated "venue mapping" - where the specific audio qualities of a venue can be reproduced. So you can hear a track as if it is being performed in, for example, the Albert Hall. Interaction - increasingly, tech is about human interaction between man and machine. The Amazon Echo smart speaker is one example. Just like Siri, you talk to the Echo - most people use the code word "Alexa" - and she responds; answering your questions, giving you details about the weather, dimming your lights or opening your garage. Alexa technology was built into several of the devices featured at CES this year. 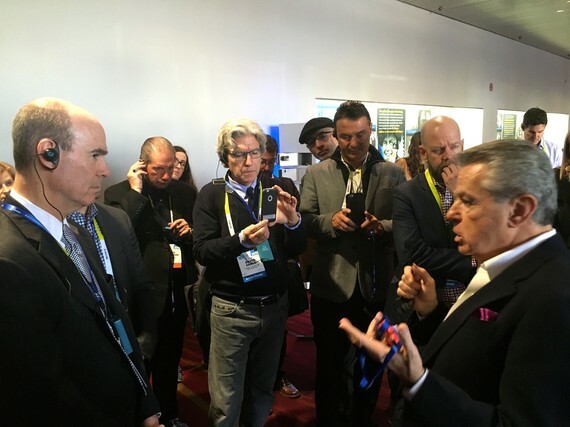 (In fact, as Geekwire wrote, "Amazon was huge at CES 2016, and they weren't even there.") One example of Amazon Echo integration is the Samsung Smart Hub fridge. To some this was a "fridge flashback" - we all remember the internet-connected fridge of some years ago. But the Samsung Smart Hub steps up the game. Using Amazon Echo, you can ask the Smart Hub to add items to your shopping list. You can upload photos from your phone to use it like a 21st Century fridge magnet. And most interesting of all, the fridge has cameras on the inside that take a shot of its contents each time you open or close the door. These are automatically uploaded to an app, so that when you are at the grocery store, you can instantly see what's in your fridge, and which items may need replenishing. Gotlieb told us that all manufacturers are angling for their particular device to become the "hub of the home." "It won't happen," said Gotlieb. "The phone will be the smart hub." We also saw multiple robots on the floor of CES, often intended to become your personal butler. As Fortune Magazine noted, "companies from Segway to Ford jumped into the butler business." And in terms of autonomous interaction, sensors loomed large at the show. When it came to healthcare, Gotlieb commented that it was all "sensors, sensors, sensors." And this trend is only beginning. "We are going to have sensors that are implantable," he said. "The potential here is just remarkable." Innovation - CES is ultimately all about invention and innovation, and there were some super-cool new tech ideas on show, such as the SCIO Food Scanner, which allows you to scan your food to instantly judge its nutritional value - e.g. fat content, carbs and calories. 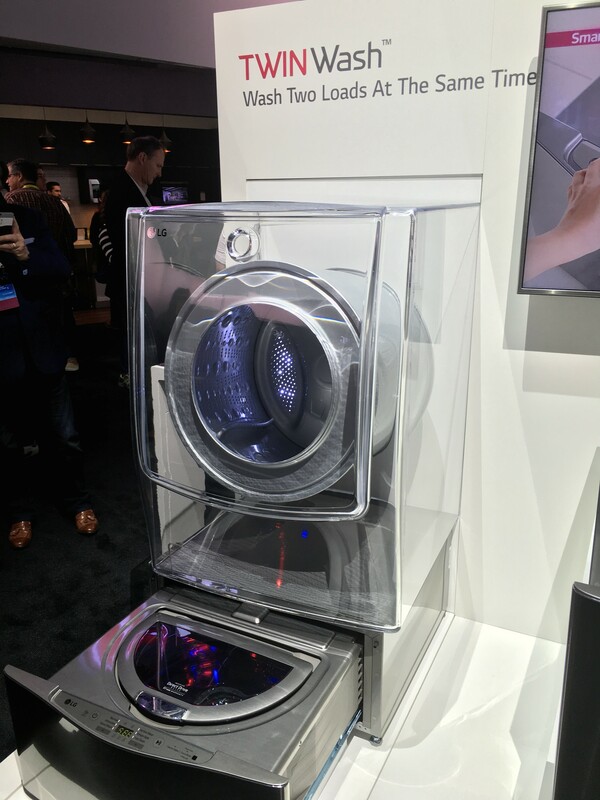 (More from Mashable on the "Best of CES 2016"). There were also some more mundane but still clever concepts such as the Twin Wash - two zones in a washing machine to wash two different types of loads at the same time. But the invention that most captured my imagination was one yet to come. Remember Google Glass? Gotlieb was dismissive of the technology as it has been developed to date, but he forecast the time in the near future when you will have micro projectors implanted under your eyelids, which will beam images directly onto your retina. By doing this, you will be able to instantly activate a heads-up display of relevant information streamed from the Internet. Imagine Google Glass without the glasses. "Ambient devices are the future," commented Gotlieb. There is a fourth 'I', which I referenced but didn't include in my list of three - the Internet of Things. It almost goes without saying now that we are careering towards a connected future, where all devices will have an IP address, send data out constantly, and exchange information with other pieces of tech. As Gotlieb told us, "the value in data comes from conjoinment." 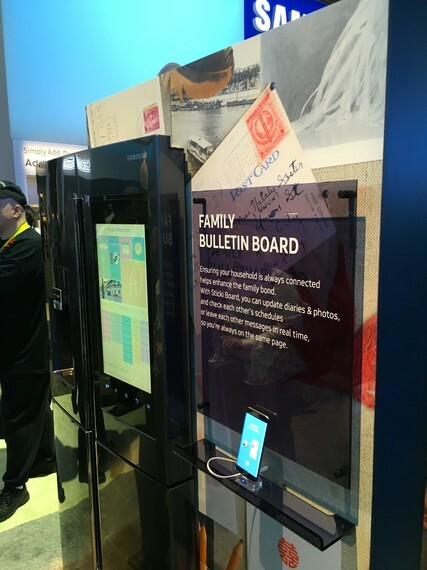 One change at CES was the proliferation of new brands. 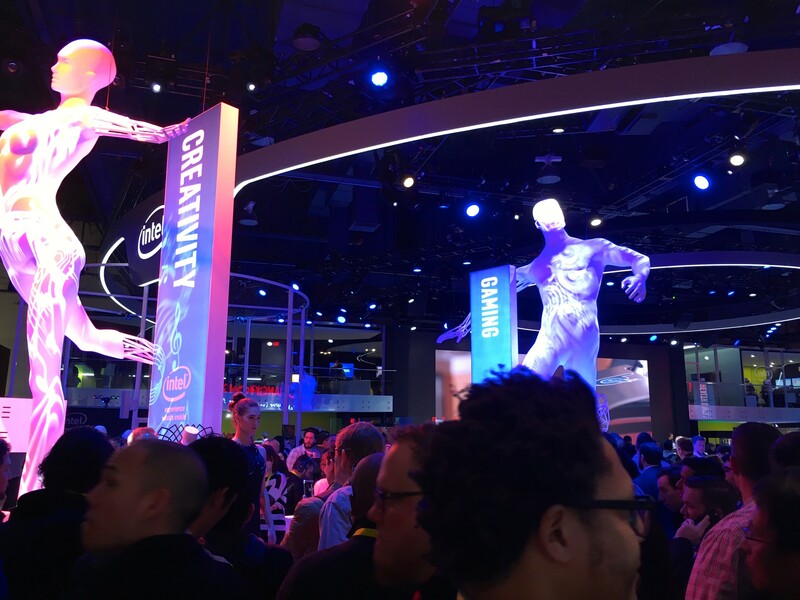 Traditionally, three brands anchored the show - Intel, Microsoft and Sony. Intel was still pre-eminent this year, and Microsoft is "coming back big-time," says Gotlieb. But Sony has "lost its way." 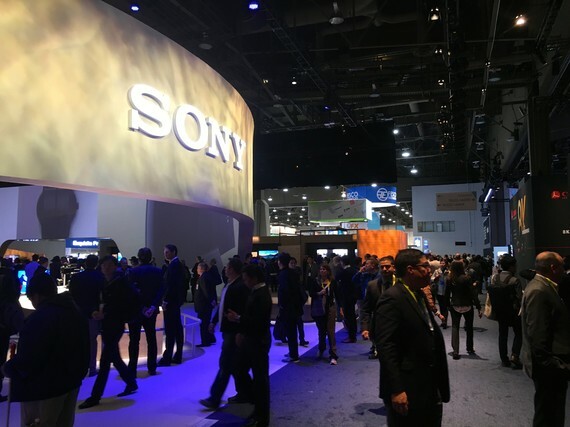 Samsung has taken Sony's mantle at CES, and the Koreans generally are dominant. 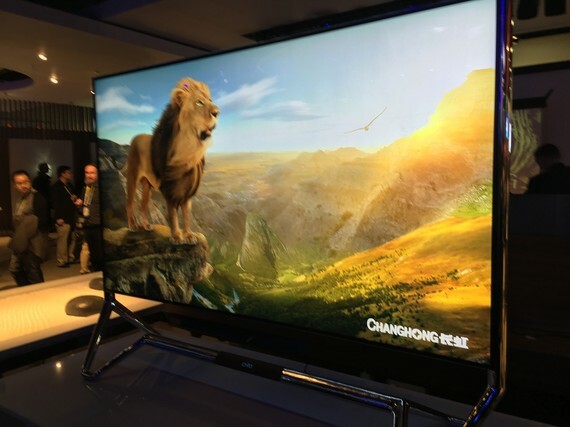 Right behind them though, are the new Chinese brands - like Changhong, which showcased a prototype 100-inch television. While they haven't got it 100% right as yet, Chinese electronics brands are definitely ones to watch. There were two other interesting categories of brands on display. There were the "back from the dead" brands such as Kodak, Polaroid, and RCA - dug up and repurposed for a contemporary era. Gotlieb scoffed somewhat at these. And there were the car brands - both old (e.g. Ford) and new (e.g. Tesla and Faraday Future). There is good reason for this - Gotlieb believes that the automobile will be "your most powerful mobile device." Post-tour, Gotlieb gave us his take on what all this tech means for the communications business. "Data is enabling us to identify every aspect of the marketing funnel," said Gotlieb. "But in this new world, top-of-the-funnel awareness and inspiration is vital. Media in fact becomes virtual shelf-space as the physical store declines in importance." Coming back from CES feels like coming out of a dream. To some extent, it's good to get back to reality. And to do so with an expanded view of what's to come, and what may impact our personal and professional lives in the not-too-distant future. *Two disclosures: 1) Group M is part of WPP, which is also my organization's parent company, 2) Sennheiser is a client of Labstore, the business I head up.